Oops - we don't appear to have a video for the ScanJet Enterprise 7000N. Improve workflow and boost productivity with a shared document capture workstation offering familiar manageability and advanced networking and security features, along with an easy-to-use touchscreen interface for everyday users. Manage documents and workflows directly from this departmental document capture workstation. Streamline document workflows with this departmental document capture workstation. Use the large colour touchscreen display and built-in keyboard to view, verify and modify documents prior to sending them into the workflow – no need for a PC. Robust security and easy network manageability with HP Web Jetadmin. Boost productivity and enable sharing with advanced networking and easy user interfaces. Enjoy the familiar manageability and robust security found on HP multi-function devices, including industry-leading HP Web Jetadmin network management software. 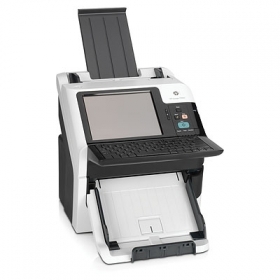 Fast, easy and reliable document capture with versatile document handling features.